LOTS AND LOTS OF PICTURES TODAY!!!! I accomplished a lot today. I actually shaped the peghead last night. 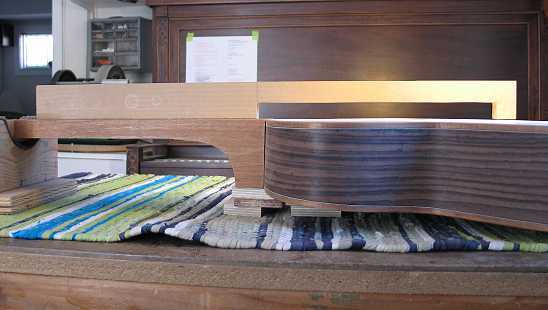 I stuck the template on top of the veneer with double-stick tape, flipped it all upside down, and used a Robo-Sander to follow the template. 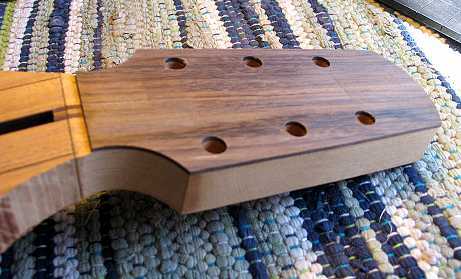 Then I used the soundhole cutout to mark the bottom shape of the rear of the peghead. 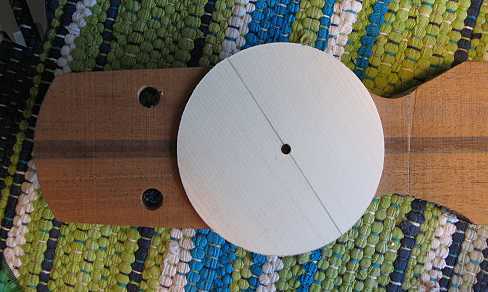 I marked the 1/2" thickness of the peghead and where it will scoop down to form the volute. 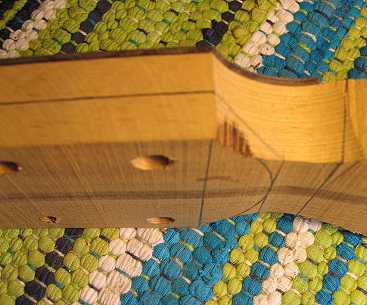 After first cutting close to the line with my bandsaw, I then used the belt sander to sand up to the line and form the volute. 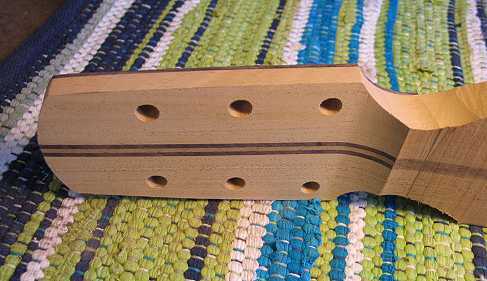 Later this will be sanded to form the curved bottom of the peghead rear. 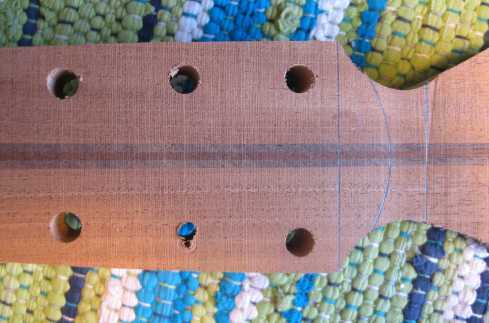 Next, in preparation for doing the preliminary neck angle work, I used the table saw to cut the end of the neck blank at the 14th fret position. After a few tries, I got the angle right. 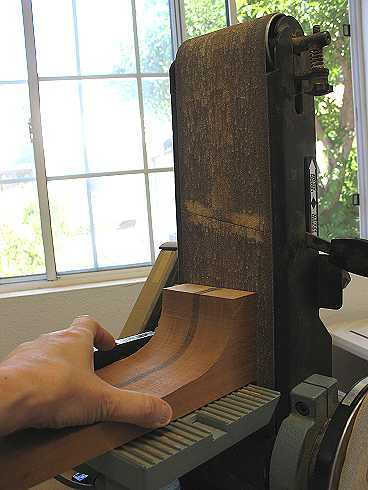 Here I am checking it with a simple MDF straightedge. 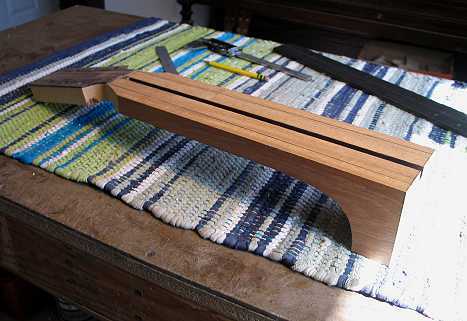 I want barely any space between the straightedge and the top at the saddle position. 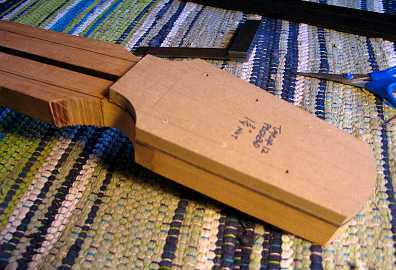 The neck angle and centering of the neck will be fine-tuned later, after I carve the neck and am able to bolt the neck to the soundbox.